Fulton, NY – United Way of Greater Oswego honored one of its strongest supports with the award for Outstanding Special Event. DuFore’s Jewelers was recognized for an event that, since its inception in 2006, has become synonymous with the Christmas season, the DuFore’s Diamond Ring Drawing. 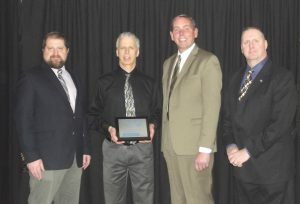 Cut line for photo: DuFore’s Jewelers was the recipient of United Way of Greater Oswego County’s Outstand Event Award. DuFore’s Jewelers was recognized for its annual Diamond Ring Drawing that benefits the United Way Annual Campaign. From left are United Way Board President Clark Stanton of Oswego Valley Insurance Agencies, Mark DuFore, United Way Executive Director Patrick Dewine, and Board Member Rob Rolfe of Harmony Financial Services.